You've gotta love a really great, creative idea. And it's even better when there are some really great people behind it. 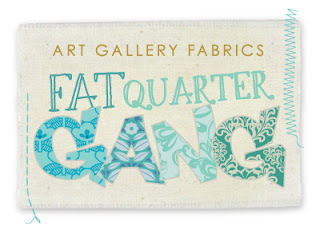 That's why I was so excited to be invited to be a founding member of Art Gallery Fabrics' new "Fat Quarter Gang." The idea of the Fat Quarter Gang is pretty simple: the oh so lovely Pat Bravo rounded up a group of bloggers and designers to form a little sewing group of sorts -- a sewing group that would combine their fresh, new sewing ideas with all of the gorgeous new fabrics coming out of Art Gallery HQ. Then, once a week, a member of the group would share a new pattern or project idea on the Art Gallery Fabrics blog. And so, from the streets of Miami, the Fat Quarter Gang was born. But Pat, Anais, and the creative troupe at Art Gallery took their idea to the next level by totally embracing -- in a fun, lighthearted way, of course -- the "gang" part of the Fat Quarter Gang. So each of us, as sweet and gentle as we may appear to be on our blogs -- embraced our inner sewing bada$$ and took some (completely embarrassing) member photos. Admittedly, it's one of the lamest. Despite hailing from the mean streets of Brooklyn NYC, gangster doesn't come too easily to me. But you MUST check out the other bloggers' photos -- some of them are PRICELESS. You can find them all here. Have a blog and think you can hang with the gang? There are 4 guest spots open for blogging "newbies." After all 12 bloggers have posted their tutorials, the gang will have a spot open for a guest blogger (that could be you!) to post their project tutorial. This pattern will repeat itself for 1 year so you have 4 spots available. Also, if you have a blog, you can follow the gang by grabbing a "FQG button" located on the right side of the Art Gallery Fabrics blog! Think you got what it takes? Submit your project ideas along with a link to your blog to anais.cowley@artgalleryfabrics.com. Who knows, you might end up with your own gang name and pic too. Stay tuned for my first Fat Quarter Gang free project idea in July. I can't wait to see more projects that the "gang" comes up with... Too much fun, Q-Diddy. "Gang" pictures are great and fun. Love the projects so far and can't wait to see what's next. Okay look at those white white arms.......don't you live in the south homeboy? Have fun with it ,I wish you continued success. 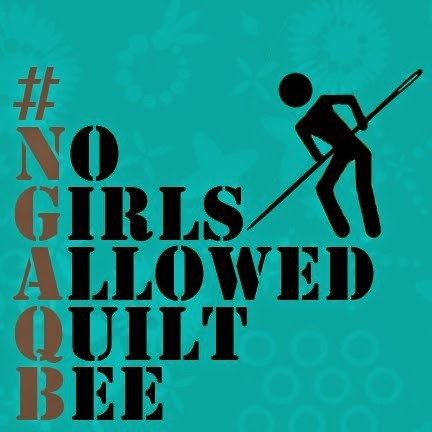 I found the monthly quilt blocks and in the middle of clicking through all of them, found a Tar Heel button on a blog! I was born in Raleigh and went to school in Chapel Hill, and have now bookmarked your blog for further fun. Excited for football, and getting really excited about basketball after last year's disappointment. Stumbled across your blog and will be telling all my quilting friends about it! 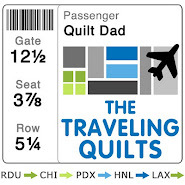 A man that quilts?! Love it! Your family look lovely - please join my blog and be my token crafty male - maybe you'll inspire other quilting daddy's to come out the closet so to speak! Happy quilting and best wishes from across the pond to you and your lovely family. Saw your Gradiance Bed Runner on the Art Gallery Fabrics blog...it's awesome and would be perfect for our bed. I have a dog that loves to sleep on the end of the bed and it would be great for protecting my bedspread from dog hair and those pointy dog nails. I love the Oval Elements fabric line, especially the Sapphire. John I have been following your blog for awhile and as the newsletter editor for my guild I am going to put you as the featured blog for September...hope you don't mind ;) Love the Fat Quarter Gang!